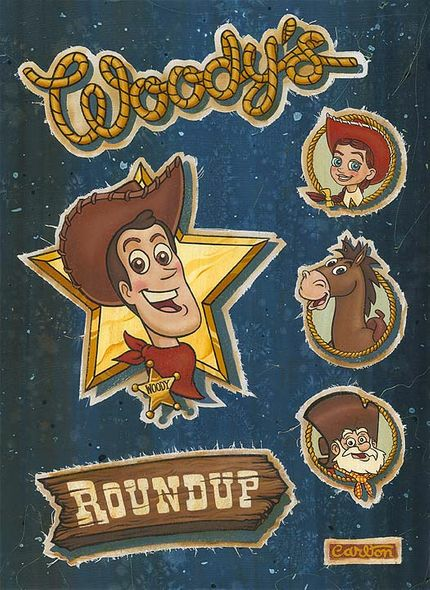 Home | Disney and Animation Art | Pixar | The Pixar Collection | Trevor Carlton | Trevor Carlton Signed and Numbered Hand-Textured Giclée on Canvas: "Woody's Roundup" OFFICIAL | Gallery Direct Art | 800-733-1144 Free Ship. No Tax. Trevor Carlton Signed and Numbered Hand-Textured Giclée on Canvas: "Woody's Roundup"
About The Artist:Monte Trevor Carlton was born in 1972 in Olympia, Washington State. Although he took up painting in high school, the first artistic passion that Trevor embraced was acting. He decided to forgo an art scholarship in favor of attending a dramatic arts scholarship at Skagit Valley College. It was here that a style was born. Using reclaimed lumber as his "canvas", he started painting images of vintage Americana with subjects ranging from pop icon celebrity to the hey day of jazz. Home | Fine Art Prints & Limited Editions | Collectors Editions | Disney Fine Art | Trevor Carlton | Trevor Carlton Signed and Numbered Hand-Textured Giclée on Canvas: "Woody's Roundup" OFFICIAL | Gallery Direct Art | 800-733-1144 Free Ship. No Tax. Home | Disney and Animation Art | Disney Fine Art | Trevor Carlton | Trevor Carlton Signed and Numbered Hand-Textured Giclée on Canvas: "Woody's Roundup" OFFICIAL | Gallery Direct Art | 800-733-1144 Free Ship. No Tax.